Until now, acreage was designated for either photovoltaics or photosynthesis, that is, to generate electricity or grow crops. 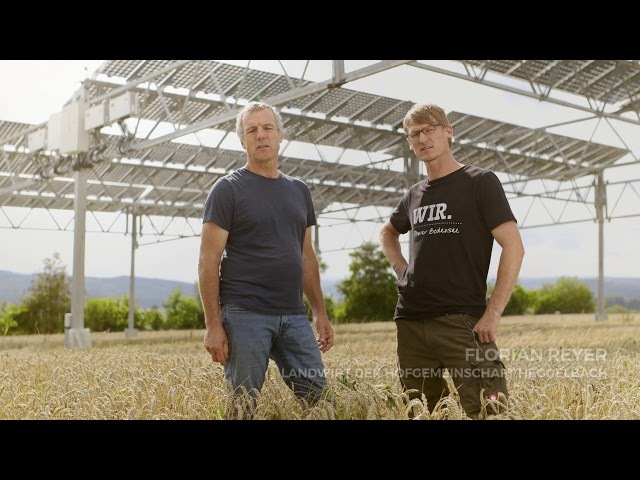 An agrophotovoltaics (APV) pilot project near Lake Constance, however, has now demonstrated that both uses are compatible. Dual use of land is resource efficient, reduces competition for land and additionally opens up a new source of income for farmers. For one year, the largest APV system in Germany is being tested on the Demeter farm cooperative Heggelbach. In the demonstration project “Agrophotovoltaic – Resource Efficient Land Use” (APV-Resola)” led by the Fraunhofer Institute for Solar Energy Systems ISE, solar modules for electricity production are installed directly above crops covering an area of one third hectare. Now the first solar harvest of power and produce has been collected on both levels. The PV plant with installed power of 194 kilowatts covers an area of one-third hectare. The first grain harvest of the APV system is being gathered. In summer, the electricity demand of the farm was almost completely covered by the PV array. With an installed power of 194 kilowatts, the photovoltaic array can supply 62 four-person households with electricity. In the first twelve months, the array produced 1266 kilowatt-hours electricity per installed kilowatt, one third more than the average value of 950 kWh/kW in Germany. The electricity produced by the APV plant is both self-consumed as well as fed into the grid. The project goal is to develop APV system technology into a market-ready product. “In order to provide the necessary proof-of-concept before market entry, we need to compare further techno-economical applications of APV, demonstrate the transferability to other regional areas and also realize larger systems,” explains Stephan Schindele. For example, different possible applications shall be explored in combination with fruit, berries, hops and wine crops and with the various technologies such as energy storage, special films with organic solar cells and solar PV water treatment systems. “Besides investment from industry and research policy, appropriate political measures supporting the technology are of vital importance for a successful market entry,” adds Stephan Schindele. Already in 2014, Fraunhofer ISE and the Wuppertal Institute, supported in tandem by the University of Hohenheim, made a joint statement proposing that agrophotovoltaics be considered separately in invitations for tender while in the test phase.